I’m starting off the first week in December with the first of my Christmas Gift Guides. This gift guide includes my picks for the perfect beauty stocking fillers. Everything from hair to hands, I’ve got you covered. 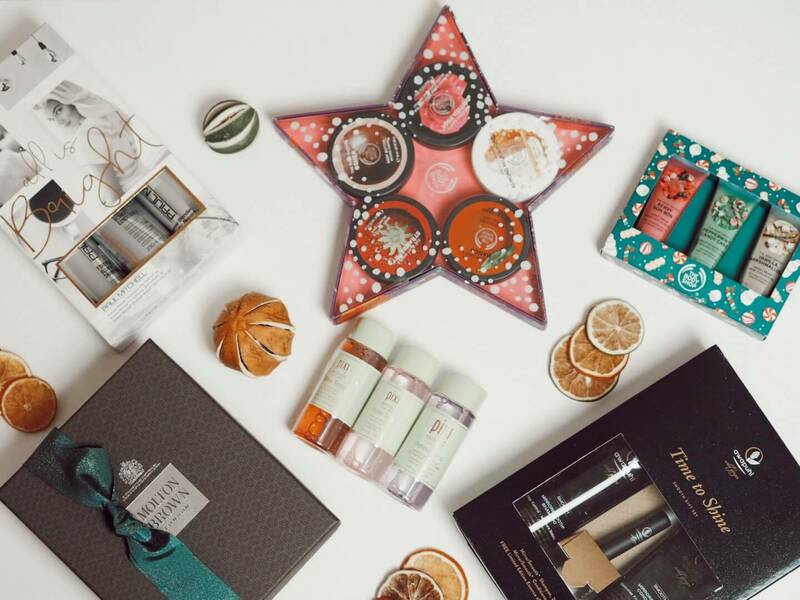 The Body Shop have some incredible gift sets every single Christmas, and this year is no different. If you can’t pick just one scent, then these gift sets mean you don’t have to. The Body Butters Stars of the Forest* contain five different body butters. The Almond Milk body butter is my personal favourite. For a treat on the go, why not pick up the Festive Hand Cream Trio*, there are three delicious hand cream scents; Berry Bon Bon, Peppermint Candy Cane & Vanilla Marshmallow. Molton Brown is another great option if you have a slightly higher budget. The Rhubarb and Rose* hand wash and hand cream make a particularly delicious gift. 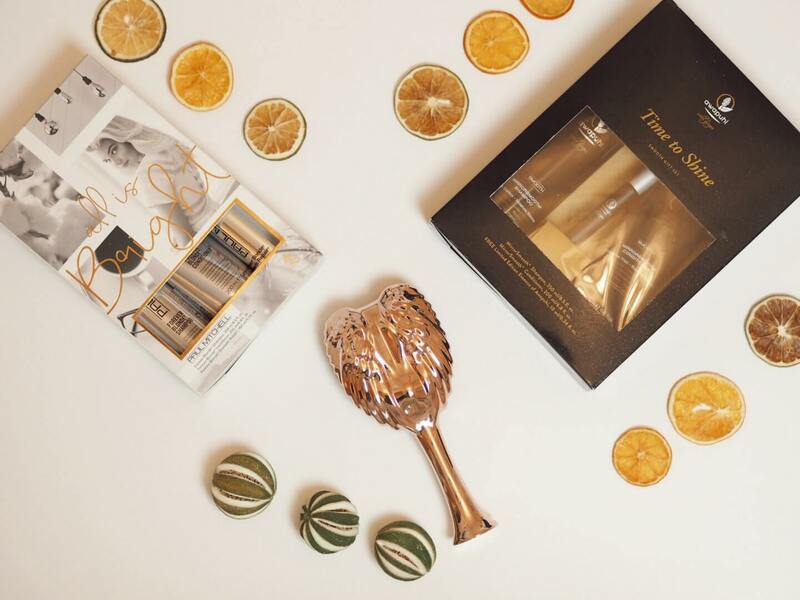 Who doesn’t love some luxury haircare? Paul Mitchell do exceptional gift sets. I’m currently using the Awapuhi Smooth shampoo and conditioner and my hair feels like it’s had a treatment every time I wash it. I’ll definitely be trying the Time to Shine gift set when I’ve finished with this set. Paul Mitchell also offer colour specific gift sets, I recently received the Paul Mitchell All is Bright gift set which is perfect for my blonde hair. The packaging is particularly gorgeous – I know I’d love to open this as a gift on Christmas morning. For a gift that looks as good as its use, then I’d highly recommend a Tangle Angel. I was sent this stunning rose gold one. Cassie stole my black one and she definitely won’t be getting her paws on this. Luckily you can get your furbaby their own brush from Pet Angel. Pixi has been a longtime favourite brand of mine. You’re probably familiar with the original Glow Tonic, but you may not know there is also the Rose and Retinol Tonic’s in the range*. They’re also all available in travel size, making them perfect as stocking fillers. I’ve been saving them for this post, but I’ll write a review as soon as I’ve given them a good try. I hope my beauty stocking fillers have given you some ideas for your loved ones this Christmas. *This post features PR samples. These are all amazing products, thanks for sharing this guide! The body shop miniatures are so lovely, what a great little gifts! these packs are so fun! cute post! These are adorable dear. Great products you have here. Thanks for sharing! Ahhh such cute ideas babe!